We looked at the innovations from Rancho (Amir Khan) in “3 idiots”. Well, there was also a “Real Rancho” a Babu turned dashing entrepreneur who put the city of Ahmedabad prominently on the map of industrial India. 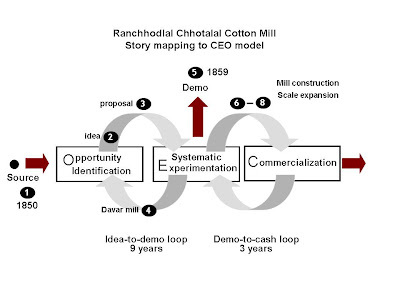 Let’s look at how Ranchhodlal Chhotalal (1823-1898) went about setting his cotton mill. 1. A project was promoted by a group of merchants in Surat in 1847. Their idea was to use modern technology to product cotton goods. Some Englishmen working or living in Gujarat acted as their technical consultants. The project, however, did not go beyond the conception stage as the promoters developed cold feet even before the first concrete steps were taken. 2. 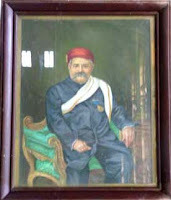 Ranchhodlal Chhotalal was a highly educated man well versed in Persian, English, Sanskrit and Gurajarati. He had risen to the highest position in government service to which an Indian could at the time aspire. Ranchhodlal came to know of the aborted Surat project from one of the British officers Captain Goerge Fulljames. 3. In 1850 Rachhodlal obtained technical details of the Surat project from Fulljames and proposed to set up an industrial dream for producing cotton goods. He joined hands with an English cotton planter, James Landon, who offered to contribute half the capital required provided Ranchhodlal arranged for the other half. A couple of Baroda bankers agreed to invest but eventually backed-off due to their mistrust in Landon. Landon withdrew and project didn’t take off. 4. In July 1854 Cowasji Davar from Bombay floated the first cotton mill, the Bombay Spinning and Weaving Company with a share capital of Rs. 5 Lakh. 5. In the meantime, Ranchhodlal restarted his effort of starting a cotton-mill in Ahmedabad. This time he succeeded in convincing investors and registered the Ahmedabad Spinning and Weaving Company in 1859 – close to a decade after he conjured up his dream. The capital involved amounted in the first instance to one lakh of rupees and the mill contained at first 2,500 spindles only and no looms. 6. A number of factors contributed to the delay between the foundation of the mill in 1859 and its actual opening in 1861. One, Suez canal had not opened and all vessels from England had to sail via the Cape. Second, the ship carrying the machinery for the new mill caught fire and was lost at sea. It was insured and fresh machinery was ordered. The English engineer who came for building the mill, C. Dall, died before the machinery arrived. The machinery had to be transported from Bombay to Ahmedabad on bullock carts. 7. After unsuccessful engagements with four European engineers, one Edington completed the work and served for two years from 1861 to 1863 and put the whole mill into good working condition. 8. Initially the mill barely paid a dividend of six percent. Hence, additional capital was raised to increase the number of spindles from 2,500 to 10,000 and to establish weaving department with 100 looms. This increased the dividend to nine percent and substantial fund was carried over to reserve fund. 9. Subsequently, Ranchhodlal built second mill in 1872 containing 14,500 spindles. The mill prospered until 1875 when a disastrous fire destroyed practically the entire building which was uninsured. Ranchhodlal rebuilt it with his own expenses within a short time of a year. 1. Collaboration with British: Unlike his peers Ranchhodlal built successful partnerships with Britishers in raising money as well as gaining technical know-how. His government service helped. 2. Successful demo: Let’s define success demo is that milestone when the investors actually put money. This happened for Ranchhodlal in 1858-59. And it did not happen because Ranchhodlal showed any prototype or demo. It happened because Davar showed that the model works in Bombay and that boosted the confidence of the investors. It’s like saying, “Look, I can do it here because, he has done it there”. And the same logic didn’t work when “here” meant Ahmedabad and “there” meant Manchester. 3. Role of insurance: There were two Black Swan events each could have potentially crippled the whole business depending upon circumstances. First one when the ship carrying machinery caught fire and the second one when the second mill was burnt. Insurance helped in the first one and Ranchhodlal was rich enough by the time second event happened. 4. Finding optimal scale: As the first mill started operations Ranchhodlal figured out that 2,500 spindles are not enough and the mill needs looms too. When the spindle count was increased to 10,000 and 100 looms were added, the divided reached a respectable nine percent. 3 Idiots: Is it a crash course on innovation? “3 Idiots” has become the highest grossing Bollywood movie of all time. The movie has enough masaala so that anyone irrespective of age and education can enjoy it. My 3 year old nephew became a fan of the catchy phrase “Aal izz well”, my wife got hooked on to the title song and my son learnt a few funny Hindi words. I also heard someone saying, “Do you want a crash course on innovation? Go watch 3 Idiots”. Prof. Anil Gupta of IIMA, the torch bearer of India’s grass-root innovations, said in Livemint, “I hope what Munnabhai did for Gandhigiri, this film will do for innovation in India” So, is 3 Idiots really a crash course on innovation? My answer is both ‘yes’ and ‘no’. It indeed does bring out many practices and issues associated with innovation. And at the same time, it does not touch upon a few critical areas. · Significance of experimentation: Joy Lobo’s experimentation and Rancho’s improvisation after Lobo’s death brings out the importance of experimentation. Such experimentation is at the heart of innovation. Prof. ViruS’ view that “Only successful experimentation deserves credit” shows our ignorance of the real outcome of experimentation – learning. · Role of passion: Farhan Qureshi is passionate about photography; but doing engineering because his father feels so. This is a common story in Indian context. Rancho eventually convinces Farhan to follow his passion. Innovation is more like a marathon – only those who follow their passion can last the 42km stretch. · Awareness of intellectual property: Rancho runs a school in Ladakh where he has hundreds of patents to his credit. US returned Chatur finds it attractive enough to develop partnership. · Types of innovation: There are several types of innovations. Patent lead product innovation is just one of them. · Commercialization process: Demonstrating prototypes of the ideas as shown in Rancho’s school in Ladakh is an important step of every innovation. However, a successful innovation needs demonstration of viability of business or viability of impact (in case of social innovations). The movie does not show it. · Catalysts like communication & collaboration: “How you communicate your idea” and “How you find partners” are important skills in the innovation process. It isn’t a loner’s game like golf. The movie does not bring this out. Note – “3 Idiots” is a commercial movie and “spreading importance of innovation” is not its objective. I enjoyed the movie. And I recommend it to anyone who can watch Hindi movies (watching Hindi movies needs certain DNA). In a previous article, I wrote about how the method of innovation has evolved over the past century. In a three part series I am writing about my favorite milestones in this journey. These milestones are not necessarily the first occurrences but they are more representative of how the method of innovation has evolved. In many cases the milestone would have catalyzed what was to happen in future. This article is the third of the three parts. Check part-1 (includes a picture) and part-2. · Innovation and entrepreneurship, Peter Drucker (1985): Peter Drucker made two significant contributions through his book “Innovation and entrepreneurship”: (1) He said that innovation ought to be a discipline (2) Basic principles of the discipline are same whether the innovation is in for-profit context or a not-for-profit (or social) context. He identified seven sources of innovation and also suggested four innovation strategies. 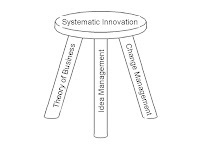 Drucker’s approach ignores three basic areas of systematic innovation (1) idea management systems (2) social psychology and how it helps to improve rate of idea adoption (3) role of systematic experimentation. · Organizational culture and leadership, Edgar Schein (1985): Schein published his seminal book “Organizational culture and leadership” the same year Drucker published his book. Schein’s primary focus is not innovation. It is organization culture and how to manage it. As it turns out, culture plays a key role in organization’s innovation stamina and it is extremely difficult to change. Typical change takes over several years or perhaps decades. Schein lays basic foundation of this topic in this book. · Ideo, reality show on ABC (1999): Ideo made a significant contribution to systematic innovation. It brought the topic closer to public. It demonstrated in an ABC documentary titled “Deep Dive” (1999) that innovation can be done on a reality show. It showed how the first loop of experimentation can be executed systematically. Subsequently, Tom Kelley published two excellent books on this topic: The art of innovation and The ten faces of innovation both containing lots of pictures. · Experimentation matters, Stefan Thomke (2003): “Experimentation matters” by Stefan Thomke is the first book which gives comprehensive treatment to the topic of systematic experimentation. It presents six principles of experimentation including the front-loading, fail early and fail often, organizing for rapid experimentation etc. · Black Swan, Nassim Taleb (2007): In Black swan, Nassim Taleb makes following significant contributions: (1) It shows that innovation belongs to a category where Bell curve does not hold true. (2) “Prediction disability” is fundamental to human nature and trying to predict which technology, trend, product will be a winner is a loser’s game. (3) It presents a possible area where innovation mathematics may reside – mandelbrotian fractal geometry. · Made to stick, Chip & Dan Heath (2007): In Made to stick, Chip brothers present a practical and robust framework for communicating your idea effectively. In doing so, it brings out the fundamental biases humans work with and identify the chief villain as: curse of knowledge. Stories and metaphors are sticky; numbers and abstractions aren’t. It gives us a perspective while watching Steve Jobs videos and reading Esop’s stories. · Game changer, A G Lafley (2008): See A century of systematic innovation: From Edison to Lafley. In a previous article, I wrote about how the method of innovation has evolved over the past century. In a three part series I am writing about my favorite milestones in this journey. These milestones are not necessarily the first occurrences but they are more representative of how the method of innovation has evolved. In many cases the milestone would have catalyzed what was to happen in future. This article is the second of the three parts. Check the first part here (includes a picture). · 3M’s 15% rule (1945): 3M introduced a rule called “15% rule” in 40s (I don’t know the exact year). It was equivalent of two daily coffee breaks plus lunch time. Most people misunderstand the rule as “bonus time”. It is actually a “permission to experiment without having to tell your boss”. Most of the time it amounts to working “115% of the time” i.e. you do your experiments in your extra time. Google popularized it as the 20% rule. (Source: A century of innovation: The 3M story book). · Everett Rogers’ Diffusion of innovations (1962): In his seminal work Diffusion of innovations, Everett Rogers defines diffusion as the “process by which an innovation is communicated through certain channels over time among the members of a social system.” It could be a best practice spreading in your organization or a new product like mobile phone spreading in a country or a city. Adoption of ideas follows an s-curve when plotted over time. The categories of adopters Rogers identified are: innovators, early adopters, early majority and laggards. Geoffrey Moore popularized this terminology further in his book “Crossing the chasm”. (source: wikipedia Diffusion of innovations). · Venture capital industry (Sequoia Capital) (1972): In 1972 two of the most successful venture capital funds were founded in Silicon Valley: Sequoia Capital and Kleiner Perkins. The VC industry would constitute one of the key elements of the innovation ecosystem that will make Silicon Valley innovation capital of the world. (Wikipedia sequoia capital, Kleiner Perkins, history of venture capital). In a previous article, I wrote about how the method of innovation has evolved over the past century. In a three part series I will briefly write about my favorite milestones in this journey. These milestones are not necessarily the first occurrences but they are more representative of how the method of innovation has evolved. In many cases the milestone would have catalyzed what was to happen in future. This article is the first of the three parts. You can also check part-2 and part-3. · Edison’s invention factory (1876): Thomas Edison founded “Invention Factory” in Menlo Park, New Jersey. Over the next few decades this factory would churn out not only new products but also help create new industries such as electricity distribution and phonograph. Also see: Thomas Edison, the father of systematic innovation, Edison’s method of innovation, wikipedia page on Edison. Recently I prepared a talk titled “A century of systematic innovation: From Edison to Lafley”. In the past four months I have delivered the talk in a dozen organizations in Bangalore and Hyderabad. Three of them were management institutes and nine were technology organizations (like Siemens, Texas Instruments, ADP, Intuit, Aricent etc). In this blog I am summarizing some of the questions that participants asked me during these sessions. For our definition of innovation, check out: i-squared-p (idea + implementation + profit). I am building answers to the FAQ here. It is a work in progress and your inputs are most welcome. 1. I want to innovate. Where can I start? 2. How do we get BIG ideas? 3. Is there a way of going from small ideas to big ideas? 4. What is the role luck plays in innovation? 5. We are very busy and don’t get any time other than our work. How do we innovate? 6. What kind of rewards should be given to innovators? 7. Do you have to be a visionary to be innovative? 8. If we open the idea funnel the way P&G did, how do we protect our IP? 9. What is the difference between “best practice” and “innovation”? 10. How is systematic innovation linked to organization culture? 11. How does this approach relate to TRIZ? 12. How is India doing as far as systematic innovation is concerned? 13. How do you systematically reduce risk associated with an innovation? 14. How was the decision making like in Edison’s invention factory? Was he taking all the decisions? 15. I am researcher. How do I go from research to innovation? 16. Did P&G only do incremental stuff while Edison did game-changing stuff? 17. My organization says there is no money, what do I do? 18. What is the relationship between technology and innovation? Conventional wisdom says that innovation goes hand in hand with creativity and perhaps with serendipity. 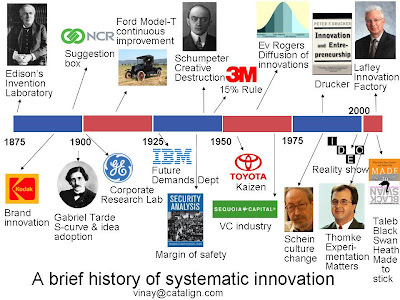 Hence, many believe “systematic” and “innovation” don’t go together. Can we really innovate systematically? To answer this question, I started studying the method of innovation starting from 19th century. In the process I discovered Thomas Edison, the father of systematic innovation. In 1876, Edison founded world’s first “Invention Factory” in Menlo Park, New Jersey with a clear understanding that said “Anything that won’t sell, I don’t want to invent”. Nobody dared to use the factory metaphor in the context of innovation in the next 130 years until A G Lafley of P&G. AG says in Game changer (2008): We started from the premise that it is possible to run an innovation program much the same way we run a factory. In Game-changer AG along with Ram Charan depicts how P&G ran the innovation factory from 2000 to 2008. I consider AG to be the torch-bearer of the systematic innovation in today’s times. Question is: What has changed since Edison? And what hasn’t? Let’s start with the second question first. What hasn’t changed? There are two things which are common to Edison and Lafley’s approach. 1. Idea funnel management: Managing idea funnel involves systematically seeking ideas that create new businesses, products, processes, customer experiences and/or improve existing ones. Edison says, “To have a great idea, have a lot of them.” And also, “As soon as I find that something I am investigating does not lead to practical results, I drop it.” Lafley says, “For every 300 ideas that enter the funnel, 1 reaches market. However, for every 2 ideas that reach the market 1 succeeds”. AG calls the success rate batting average. 2. Rapid experimentation: For both Edison and Lafley, the process of clarifying assumptions why an idea will succeed is at the heart. “Validating an assumption” is also known as experimentation. Outcome of an experiment is learning telling us “what works in what context” and “what doesn’t work in what context”. Both Edison and Lafley paid a lot of attention as to how to organize for rapid experimentation.Edison’s lab had “every kind of screw made, every size of needle, every kind of cord or wire” and much more (see the wikipedia page and search for “teeth”). P&G created enabling structures such as Clay Street that foster rapid experimentation. 1. Putting customer at the center: For Edison, the customer or market data was important in identifying opportunities. However, he paid less attention to customer input on the back-end of the idea funnel. In a response to a dealer’s complaint about lack of popular artist in the music catalog, Edison said, “We care nothing for the reputation of the artists, singers or instrumentalists. We intend to rely entirely upon the tone and high quality of the voice”. P&G, on the other hand, gives significant importance to customer feedback. In fact, brand differentiation is core to P&G’s strategy and brand is all about customer perception. P&G also focused on immersive research in identifying unarticulated needs. 2. Opening the idea funnel: For Edison, the idea funnel was mostly closed and all experiments were performed within the confines of his lab. P&G opened the funnel so that ideas can flow from all corners of the world. Indeed, P&G’s Connect + Develop program one of the most successful open innovation programs around. This increased the capacity and efficiency of the innovation process. 3. Scope of innovation: For Edison, innovation meant patent-led products and new businesses. For P&G, innovation also meant new/improved brands and new channels to reach market. See 4-types of innovations. For more info see the paper on the same topic. In the next article I will write about the questions participants asked me when I presented this topic in a dozen organizations.